I bought some buttons to match some brightly coloured yarn. Then I decided that bright orange might not be the best colour for premature babies. So I compromised. I am knitting in two colours. The buttons will match the button band, but the colour scheme is a bit calmer. 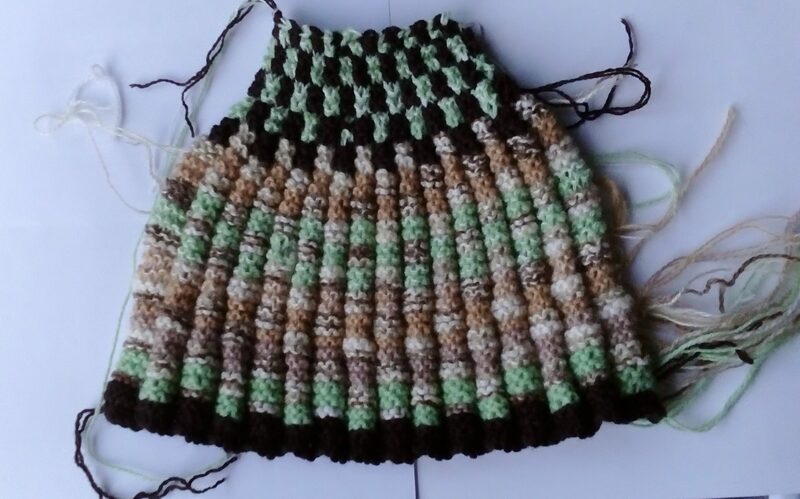 It is also more interesting to knit, even if there are more ends to sew in. 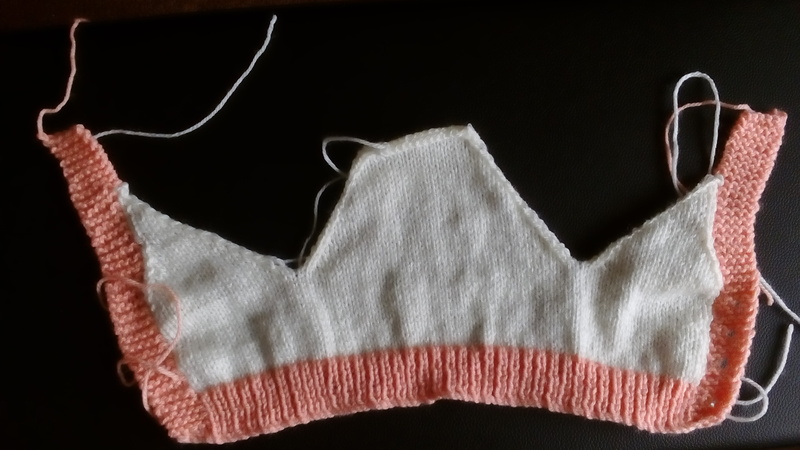 The sleeves will have coloured ribbing. I have taken two photos of this work in progress. One of the right side of the body knitted in one piece as described in a previous post. I had to wind a second ball of wool, so that I could knit the second band. This would not have been necessary if I had used the pattern as written and knitted three separate pieces. 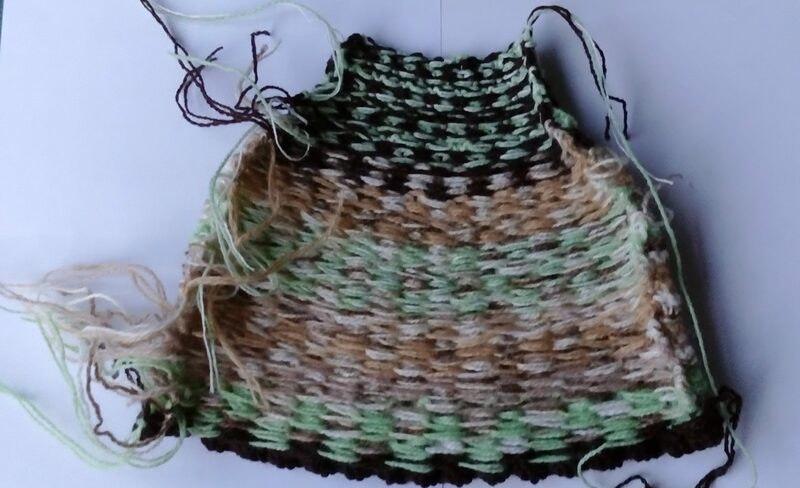 The second photo is of the inside (wrong side) showing how the two colours are twisted together to make a neat join. 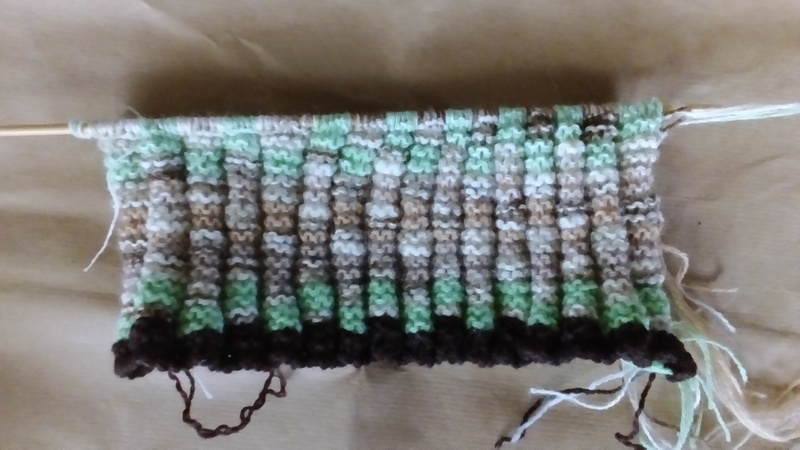 Without twisting the yarn when changing colour, the two sections would have to be sewn together afterwards. This technique is used in picture knitting (intarsia). I recently began to drink decaffeinated tea. As hubby is still drinking the usual sort, we have two teapots on the table. I found that a half-full pot of tea cools down more quickly. 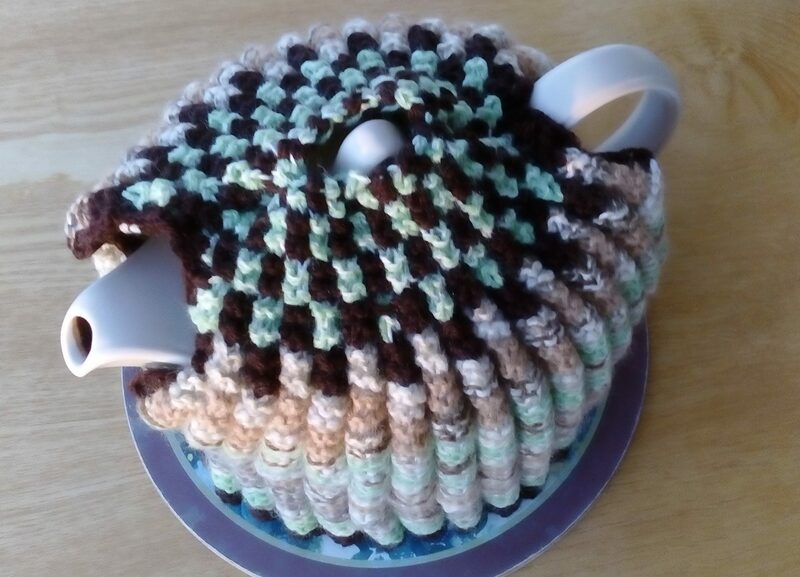 We needed a teacosy. 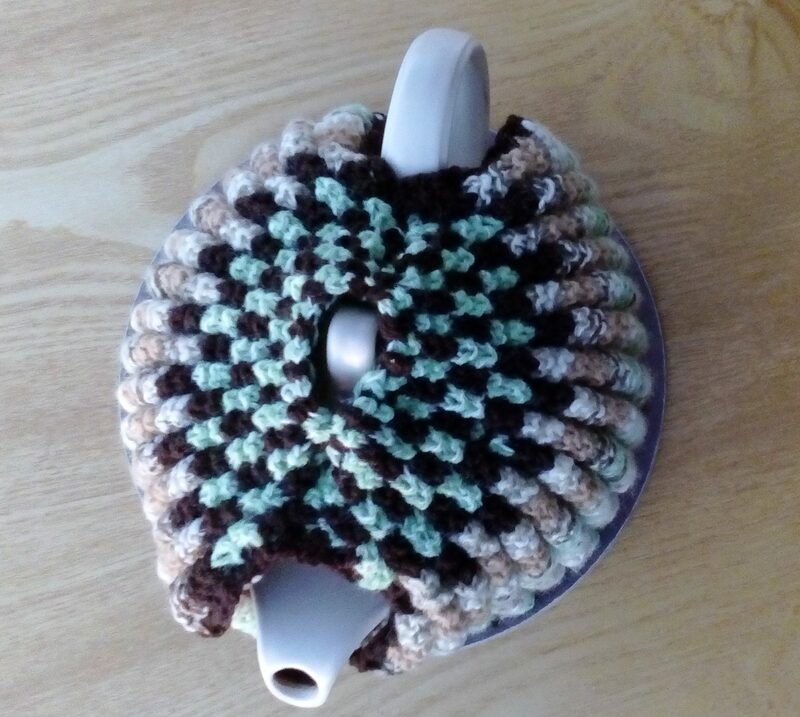 When I was a child older knitters in my family used to make fluted teacosies. I learned how to knit these from them. I am sure I have a pattern somewhere, but I couldn’t find it. However I remembered how the pattern works. What I did find was a bag of assorted yarn. The pattern is for DK yarn, but all my yarn was thinner than that. I used two strands together and spent a proportion of the total time to make the item untangling four strands of yarn! I cast on 98 stitches. The number of stitches has to be a multiple of 6 with 2 extra for the seams. Two identical pieces are required. Two rows are knitted in the yarn used to cast on; each subsequent row is worked in two contrasting colours. Unlike Fairisle knitting (where the work has to be flat and floats may be woven in during the knitting) the floats across the inside are pulled tight, giving the fluted effect. 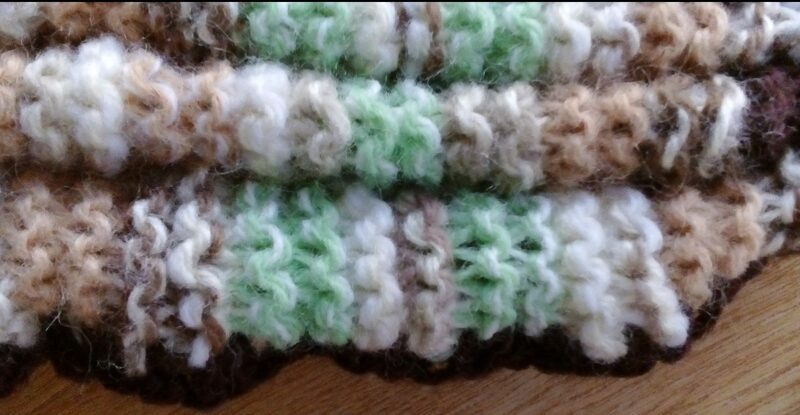 The first stitch is knitted in one colour, then six in the contrast and another six in the first colour. Repeating the twelve stitch pattern leaves one stitch at the end to be knitted in the next colour. On the reverse row it is important to put the yarn to the wrong side (facing) when not in use. All stitches are worked knitwise. Instead of knitting one side and then the other, I made both pieces at once using two pairs of size 4mm bamboo knitting needles. I was unsure how far the yarn would go and wanted both sides to match. It meant I had to keep cutting some of the yarn and rejoining it. An alternativee method is to wind small balls of yarn to divide the oddments into two equal lengths. This may reduce the number of ends which have to be sewn in. I tied the pairs of ends before sewing them. I worked out the shaping by comparing my work with the teapot. In the last few months Sue’s Trifles has been in danger of becoming entirely a book blog. To restore a bit of variety and for the benefit of those of you, who have followed this blog for the craft posts, here is something a little different. Just before I began blogging six years ago, I had made myself a dress to wear at a family wedding. Apart from a child’s dress, I have not done any dressmaking since then. I decided it was about time I made myself a new dress. Starting my project was delayed. I looked for dress fabric in a shop and an indoor market, but nothing appealed to me. Then I went away for a week on the spur of the moment and had no opportunity to do anything about my project. After that I was catching up at home. Finally I looked on line and ordered two dress lengths from a company I had been satisfied with previously. Usually when I am making a dress, I am rather obsessive about it and perhaps manage to complete it in a week. This time I took longer, perhaps slowed down by my online activities and trips out among other things. Anyhow the first dress is now finished. Its first outing was to a wedding blessing, where I was singing in the choir. Our choir robes do not fully hide our clothes and by a happy coincidence one of the colours in my dress material is a good match for the cherry red robes. Both fabrics I chose were reduced, but one was more expensive than the other. I have made up the cheaper fabric first as a practice run. It is a printed cotton lawn. 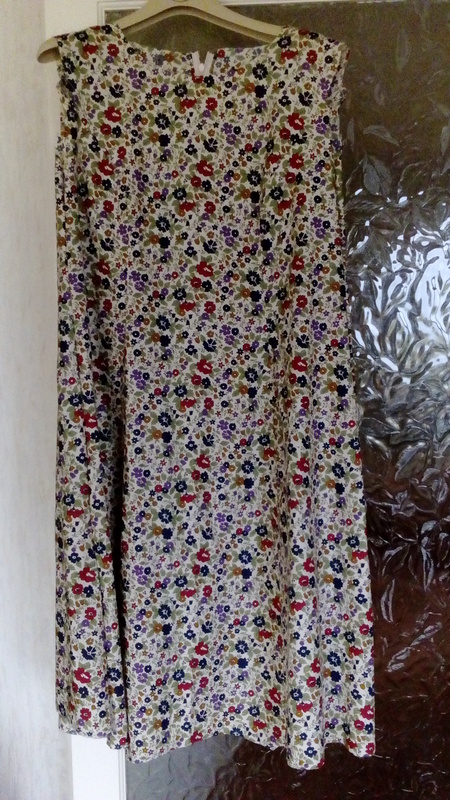 The second fabric is a Liberty print. I have been told more than once that hindsight is a wonderful thing. If I buy fabric online again, I intend to enquire about the best colour match for thread and zips. It is difficult to distinguish white from cream on a computer screen. Also shopping online only allows a whole number of metres of fabric to be ordered. Sometimes fractions are useful. I adapted a pattern I have used previously to allow for a few extra inches round my middle – time to lose weight? As this post is published I have cut out the second dress and am well on the way to finishing it. 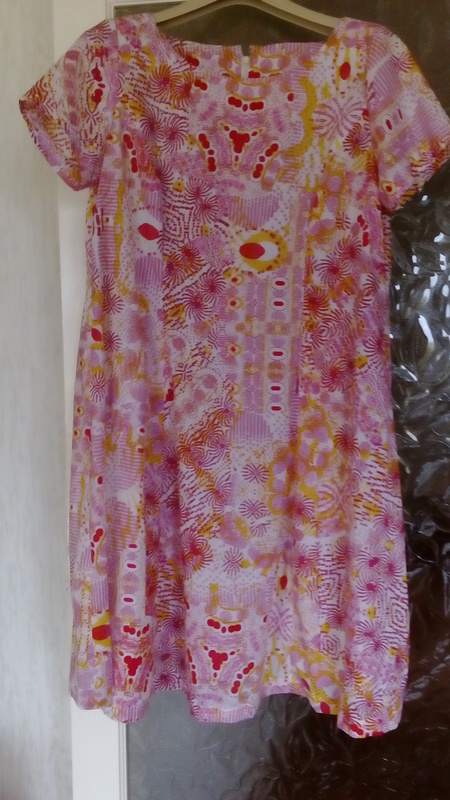 The photo shows the dress without the neck facing, which is now attached, but not finished. After that there are the sleeves to make, a few seams to neaten and the hem to sort out. It could be finished by the weekend, but I am not forgoing any of my usual activities. It is not a race!